I had a great evening last night with Robert Thompson, a modeller from British Columbia who was in town for work and was able to free up some time for an evening get-together. It was Bob’s first visit to my S scale layout but while he’s currently working in HO he’s worked in Sn3 in the past so he’s familiar with the scale. I gave him the quick overview of the layout and we discussed some of the projects I’m working on, then we ran an operating session with a freight extra. At the end of the run, I hauled out another mogul and we tried it through the same troublesome spots. It performed perfectly. Having suspected the track for the past few weeks, I’m now convinced the problem lies with the locomotive. It was too late, and I was too tired, to investigate CNR 80 at the time, but I made a mental note to jump on it this morning and give its pony truck some attention. Almost as soon as I turned it over on the bench this morning, I found what I suspect has been the culprit all this time. In a word, it’s “dirt”. The wheel treads had a fair bit of gunk on them – so much so that it was forming a fillet between tread and flange. This of course changes the shape of the tire, which throws off the whole wheel/rail relationship. I’m surprised it stayed on the track at all! Fortunately, it was quick and easy to fix: I grabbed my handy graver and carefully scraped the gunk off the wheels. Only the two wheels on the pony truck were dirty, and the whole process took less than a minute. I ran the locomotive through the problem areas a half-dozen times this afternoon without any trouble. I’m hesitant to say it, but I think I’ve finally fixed the problem. Bob – great to see you and I hope you had fun. Apologies for the fussy locomotive – I really should’ve switched it out after the first sign of trouble. Come for another visit next time you’re in town: We’ll try another operating session, and dinner’s on me! This entry was posted in CNR locomotives, eat drink and be merry, equipment, Maintenance and Repair, operations by Trevor. Bookmark the permalink. I saw somewhere that guys are having some good luck putting graphite on their rails ….. do not know for sure. 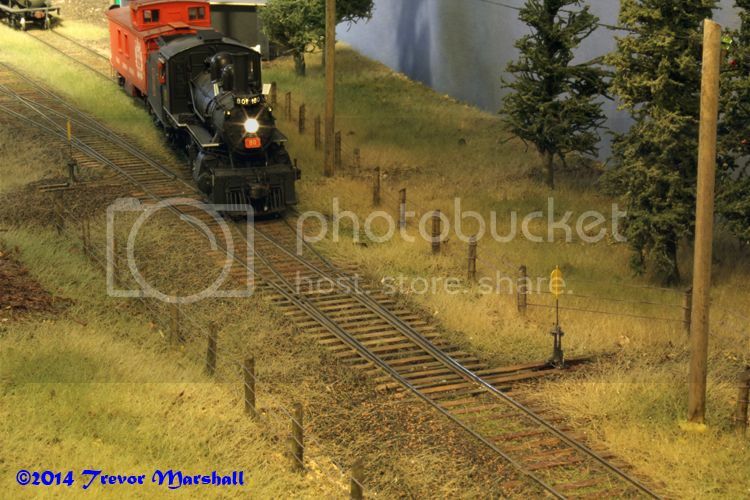 There’s been a big discussion of graphite on the Model Railroad Hobbyist forum – started in part because someone visited my layout, where I use it to fight dirty track. Here’s my post on graphite. This was not an electrical problem – but a dirt problem. In fact, the graphite probably helped keep the trains running through dirt that would’ve stopped them if the rails had not been so treated. I have decided that I TOO MUST come for a visit! If not for the fine “S” modeling, at the very least for a sampling of Toronto’s gastronomic delights!!! Trevor, at this rate you’ll be spending more time entertaining, food wise, than running trains! Gosh, my friends lived just around the corner from the Harbord House, and isn’t there a great bakery there as well? Dangerous territory for a US visitor. I always loved Bloor Street W, at the other end of their street, since every block seemed to have a different ethnic group and a different set of restaurants! You’re absolutely right. The Harbord Bakery is across the street. There are lots of great places to eat in the area.